“Never a Bystander” inspires viewers to forgive the past and find the courage to stand for their beliefs. A film for all ages and teaching resource for schools and universities. 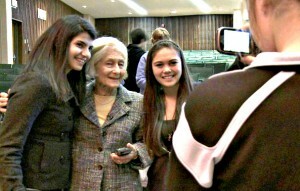 Students line up to hug Holocaust survivor Irene Butter, the film's heroine. 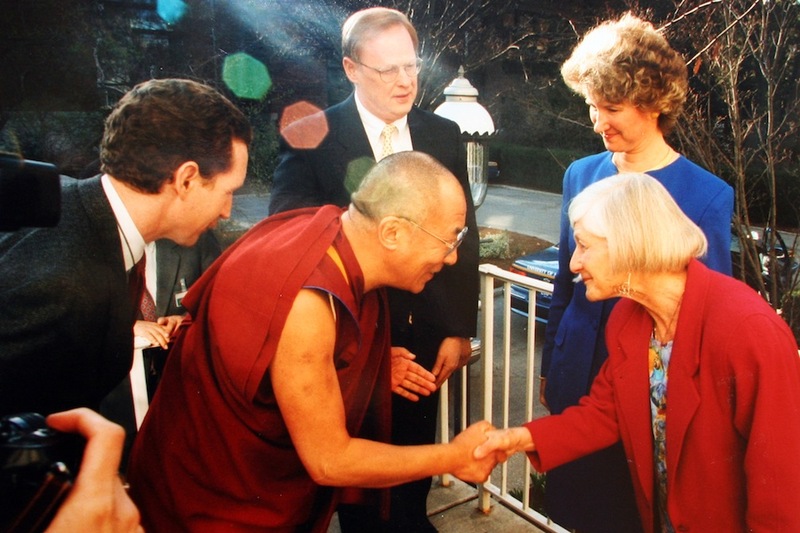 Irene Butter meets the Dalai Lama through her activism honoring modern heroes. 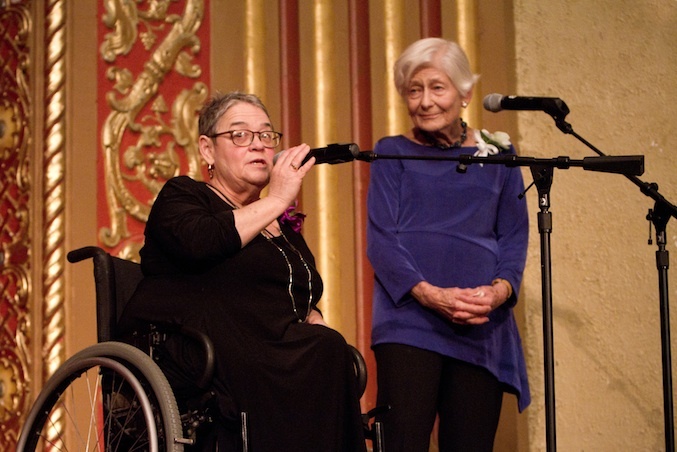 Filmmaker Evelyn Neuhaus with Irene Butter at the world premiere in 2014. 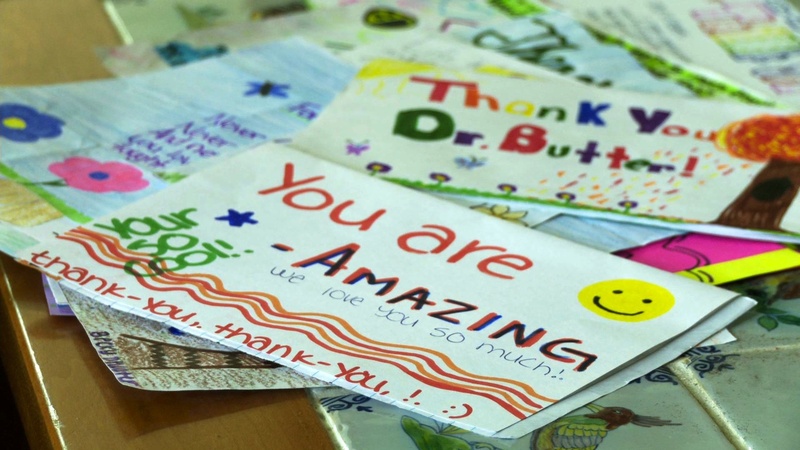 Irene Butter refers to her letters from students as "my treasures." Students are excited to pose with Irene Butter after her visit to their school. 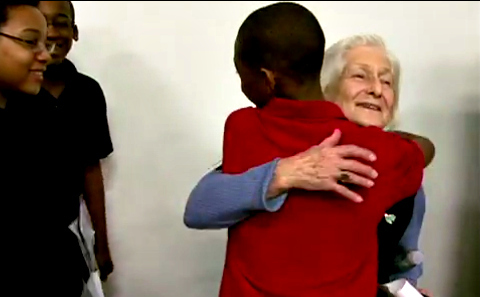 ANN ARBOR, Mich. - Dec. 10, 2014 - PRLog -- Never a Bystander, the short documentary about Holocaust survivor Irene Butter’s extraordinary work with school children, has been selected for inclusion in the 25th annual San Diego Jewish Film Festival. The February 9, 2015 festival screening will introduce California audiences to Butter’s message of forgiveness, hope, joy, and empowerment after trauma -- a philosophy she has shared with middle school and high school students for nearly 30 years. The 31-minute film will be featured as part of the festival’s JOYCE FORUM, a juried competition for short films with awards in seven categories. “I made Never a Bystander to expand Irene Butter’s reach because her impact on young people is so incredible,” said first-time filmmaker Evelyn Neuhaus. “The exposure in San Diego will help people of all ages to find hope and meaning by standing up for their beliefs and realizing that they, too, can transcend persecution or personal tragedy,” she added. · Her work to honor modern heroes by conceiving the Wallenberg Medal & Lecture which celebrates the theme, "One Person Can Make a Difference." Clips from the film, information about the accompanying study guide, and DVDs for purchase can be found at www.neverabystander.com. Since its message transcends the Holocaust, the film is not only being shown in school and university classes that teach the Holocaust. It has also been used as a resource for classes on Leadership and Social Action, and will be piloted for an anti-bullying program for fifth graders at the end of the 2014-2015 school year. Never a Bystander's release this year coincidentally dovetails with the Michigan state legislature’s consideration of a bill requiring genocide education for 8th-twelfth graders. If it is adopted, Michigan will join California, Florida, Illinois, New York, and New Jersey in mandating public school instruction on genocide, including the Holocaust. Evelyn Neuhaus is a filmmaker and retired University of Michigan administrator who lives in Ann Arbor, Michigan. Irene Butter lives in Ann Arbor and often accompanies Neuhaus to screenings for Q&A sessions with audiences. The San Diego Jewish Film Festival, celebrating its 25th year in 2015, has become one of the largest and most prestigious festivals of its kind in the country, and is one of the highest attended cultural events in San Diego, attracting over 16,000 ticket holders.